In December, CIDA and its member federations called a public meeting to express their disagreement with the approval of an amendment to the budget law concerning the pension levy of more than 100.000 euros a year. The event, held in Milan with the participation of over 1.000 people, saw, for the first time, the compact union of the main associations most representative of the management, public and private, who watch CIDA as a reference point, all driven by a common objective: to counter, at each location, the imposition of the umpteenth solidarity contribution to the detriment of the category. At the end of the meeting, the assembly approved a motion to obtain from the Government a discussion table from which concrete proposals emerge for interventions on welfare, employment and economic growth, without penalizing entire social categories, but through fairer recourse to general taxation. The motion aims to achieve solidarity through the use of fiscal leverage, to implement quickly and effectively a clear separation between social security and assistance, to avoid the approval of unfair measures, strong profiles of unconstitutionality and lack of vision on the future. The observation is general: the salaries proposed to young managers is not in line anymore to those enjoyed by their seniors. The CNC/NCK has calculated this regression based on the evolution of monthly entry salaries of engineers over a period of nearly 30 years. The category of engineers was chosen by opportunity to represent all young managers. 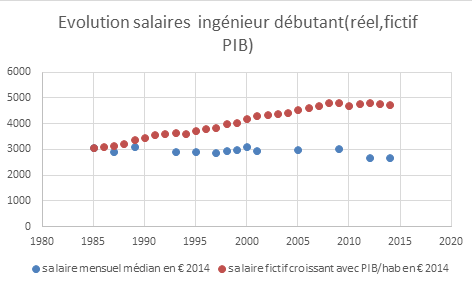 The analysis shows (see figure) that the entry salaries over decrease by 12%. This drop is observable from 2009 onwards, hence the start of the financial crisis. The precedent years, salaries remained rather stable. To verify, if this salary policy is justified, we have calculated the fictive growth of salaries indexed on the increase of the GDP since 1985. Even though the economic activity has grown 54% by 2014, this is not the case for starting engineers. Engineers are however essential actors for well-functioning economies and their development. The observation made for young managers in engineering extends to all young managers on the labour market and continues in the career progression. CNC/NCK denounces these conditions applicable to managers and particularly young ones entering the professional life. CNC/NCK recalls the important role managers play in the economy and asks economic actors to listen to their expectations and preoccupations. 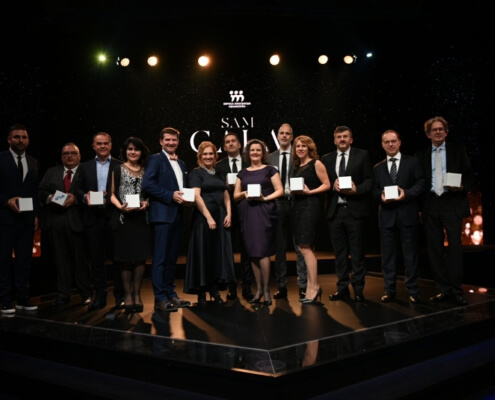 For the seventh year in a row, the Serbian Association of Managers (SAM) organized a Gala evening on the occasion of the “SAM ANNUAL AWARD 2018” in December. The prices are awarded to the best managers, companies, individuals and initiatives who advocate for the professionalization and promotion of managerial skills, better business conditions, promotion of ethical, socially responsible and sustainable businesses, development of leadership among young people, and better life for all citizens. Recognized inside and outside of the company as a person of integrity and reputation, and on the basis of achieved business results, the title of Manager of the year 2018 was awarded to Dejan Turk, CEO of Vip mobile & A1 Slovenia. One of the most important achievements of the 1974 revolution was the notion of political rights and social rights as being two faces of the same coin. The political will that led to the creation of the Portuguese National Health Service (SNS) was cultivated from this ideological framework of both political and social pluralism, which is largely majoritarian across the Portuguese society. The decrease in infant mortality rates and the longer life expectancy, among the world’s highest, probably represents the greatest achievements of the SNS. These achievements and their contribution to upward social mobility have been somewhat undervalued, as our society now eagerly devotes to the cult of the new. The ageing population is a worrying trend, even more so if public and private investment insufficiently ensure an active and quality retirement and old age. With its lack of beds for long-term care and in qualified health professionals, the public offer only serves 15% of the country’s needs. The near abdication or blatant absence of the state places an unsustainable pressure on descendants, when they exist, on health subsystems and on the social solidarity assistance network. 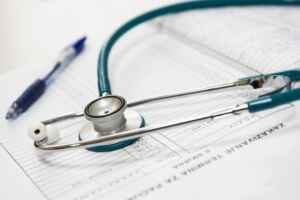 Health subsystems, which are frequently established via collective contracting between the employer and trade unions across sectors, are particularly under pressure. Naturally, it falls on the society to demand more from their political representatives. On the other hand, it also falls on mutualist systems to lead, by showing that it is possible to act in this regard and call on the state to fulfill its responsibilities.